What can I buy or sell on TApUAE ? Property for sale: Apartment, Villa, Townhouse, Penthouse, Compound, Bulk Sale Units, Commercial, etc. Property for rent: Apartment, Villa, Townhouse, Commercial, Sharing Accomodation, Short Term Accomodation, etc. Jobs: Food & Beverages, Banking & Finance, HR & Recruitment, Information Technology, Marketing & Advertising, etc. Technology: Phones, Computers & Tablets, Gaming, Cameras, Home Entertainment, Wearable Technologies, etc. Classifieds: Health & Beauty, Household, Furniture, Sports Equipment, Jewelry & Watches, Clothing & Accessories, etc. Free Stuff: Baby Items, Books, Motors Accessories, Travel & Leisure, Household, Clothing, etc. You need to meet the seller personally and buy from them. This is a Buy & Sell advertisment platform to promote your products. All transaction should be done in person. General Information: All of the fields with * need to be filled in. Ad will be rejected if the below format is not followed. Are ads on TapUAE free? You can upload 5 Additional photos other than 3 free images. You can Boost your Ad 3 times on your own. You Ad Title will be Bold. You can upload video on YouTube and show the same on TapUAE, you just to include the link of video. We charge you only for posting an Ad under certain categories. If something seems incorrect while posting ad, and your account still gets debited - We will be more than happy to refund the entire amount after analysing the payment transaction feedback. We monitor every transaction conducted on TapUAE. You are in safe hands. Ad which is being successfully placed and if you want to withdraw the ad from TapUAE. In this case, your money will not be refunded. Explore TapUAE for more exiting features. Are fake items allowed on TapUAE ? 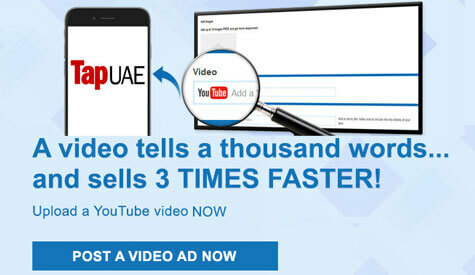 We try our best to discard fake and unappropriate Ads from TapUAE. Each Ad is being reviewed manually at the time of publishing, and when it is being edited by the seller again. TapUAE software restricts any kind of adult/pornographic, hatred, fraud, illegal or inappropriate ad. Posting photos of pornographic nature is not allowed on any category. If you find any ad which is of fraudulent nature or misguiding buyers, please report it at once. we will take immediate action. Click here to try our instant rate finder. Search Properties or Used car as desired. Search result will give you ad cards on the basis of your searches. You can see sign at the right bottom corner of each ad card. Press that icon, your ad will be shortlisted for comparison. Shorlisted ads for comparison can be seen at the top of search listing. You can add maximum of three properties or cars for comparison. Once you have shorlisted your property or cars, press Compare. It will redirect you to another page, where you can see detailed comparison analysis. TapUAE has come up with an amazing feature called "Weekly Boost". All the paid listing will come to top of the list automatically every 7th day of your posting date. Number of Weekly Bosst will depend on the basis of your package selected at the time of ad posting. Click here to know the more. Why to search whole Dubai, if you want property in DownTown or some where else? TapUAE has come up with a solution called "Map Search". You can enter your desired location and define the periphery in kilometers by sliding bar on the right. The Map Search results will have Google map and associated icons for the ads listed below the map. Therefore, you can see the ad postcard either in the map or below the map in card view. What to do if my location is not in the list? We have embedded a support form on the top of our website. Please fill that form and let us know your location. We will be happy to add your location henceforth. As a general factor, we regularly update out exhaustive list of locations. Play your video as viewer, copy the URL. Paste the URL at the time of ad posting on TapUAE. You can view your uploaded YouTube video on Detailed page of your ad. Help your buyer with the detailed demonstration video of your product. The video will look alike as mentioned below. * This feature is only available for Premium Package Ads. Upgrade your Ad now.